The British School of Tashkent is the only school in Uzbekistan to offer a world-class joint British-Uzbek curriculum. Tashkent is Uzbekistan’s capital city, home to museums, and the hum of the bazaar. This hub of Central Asia is home to The British School of Tashkent, the area’s leading international school. Students who enrol at our school become compassionate global citizens, with an understanding of different cultures and the importance of community. Located in the exclusive Mirzo-Ulugbek district, our top-quality facilities include a new Kalandar Campus with new classrooms, laboratories, three sports halls and a 25-metre swimming pool. 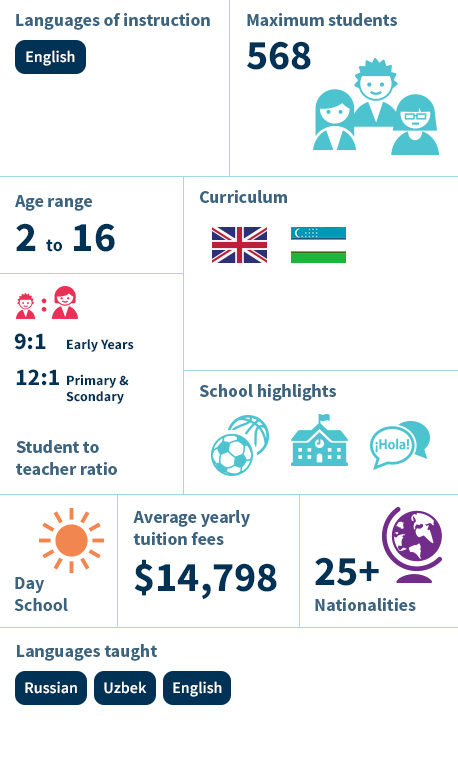 The British School of Tashkent (BST) is the only school in Uzbekistan to offer a dual British-Uzbek curriculum, whilst maintaining the highest levels of an international education and a global vision. The school offers Early Years to Secondary, with provisions to expand through to Sixth Form. Since opening in 2010, BST has become the school of choice for expatriate and Uzbek families.